The wealth of clinical experience at USC is enhanced by a comprehensive and structured curriculum that is second to none. Once a month, we feature specialty grand rounds where renowned speakers from around the world are invited to speak on their topic of expertise. These sessions are hosted in conjunction with each specialty division. A weekly clinically-based conference where senior residents, under the guidance of a faculty expert, give formal case presentations and comprehensive overview. A monthly interdisciplinary conference for the review of cases in which morbidity or mortality has occurred. Pathologic specimens and autopsy results of Internal Medicine patients are reviewed. Residents and faculty engage in a discussion regarding root cause analysis and how to use the data to improve patient care. A monthly conference whereby a senior resident, under faculty supervision, focuses on working through a broad differential diagnosis after being given limited clinical data to solve an unknown case. Faculty discussants will be present to discuss the workup and thought processes and if relevant, a Pathologist will be invited if biopsies were taken. Goldstein Morning Report is named in honor of our former Vice Chair for Clinical Affairs, Dr. Goldstein. Cases are prepared by junior and senior residents on the General Medicine Service and are moderated by the Associate Program Directors. These sessions are attended by multiple subspecialty faculty members from divisions within the Department of Medicine who expertly guide our residents through the case. A weekly session for house staff assigned to the General Medicine Service. Residents present cases as "unknowns" from the general medicine service. These sessions are moderated by the Chief Residents and focuses on board-specific material. A week-long session for incoming interns focused on easing the transition into residency. Our chief residents and core faculty present an overview of our main inpatient rotations, primary care continuity clinic, inpatient and outpatient hints, and review top nursing calls. These sessions have always been highly received by our interns. An ongoing and repeating case-based series on important topics in ambulatory Internal Medicine. Topics are assigned and presented by residents during the first half-hour of each General Medicine continuity clinic session. A monthly faculty-guided session focused on teaching house officers how to interpret and critique study designs and conclusions of landmark journal articles. The articles are presented by residents during a noon session and are facilitated by a specialty faculty discussant. An ongoing and repeating series of lectures targeted to each resident class delivered weekly in protected afternoon sessions. The lectures cover the breadth of Internal Medicine and are arranged to provide a strong fundamental knowledge base throughout residency. Preparation for the American Board of Internal Medicine Certifying Examination occurs throughout residency training. The program provides MKSAP to all entering PGY1s and a structured board preparation course begins throughout the PGY3 year. For one week during the year, all senior residents are relieved of clinical duties and participate in a dedicated ABIM Board Review course taught by faculty. This allows senior residents to focus on their studies and prepare efficiently for their upcoming boards. Residents receive state-of-the art training in procedure competency on both mannequins and fresh cadavers in our two simulation centers on campus. All residents participate in an ultrasound course in which they learn and practice to use an ultrasound machine to evaluate lung and cardiac pathology as well as for deep vein thromboses. The Healthcare Administrators Scholars Program (HASP) is a two-year educational program for senior residents interesting in obtaining formal training in healthcare administration through didactics, exposure to hospital leadership, mentorship, and hands on experience. 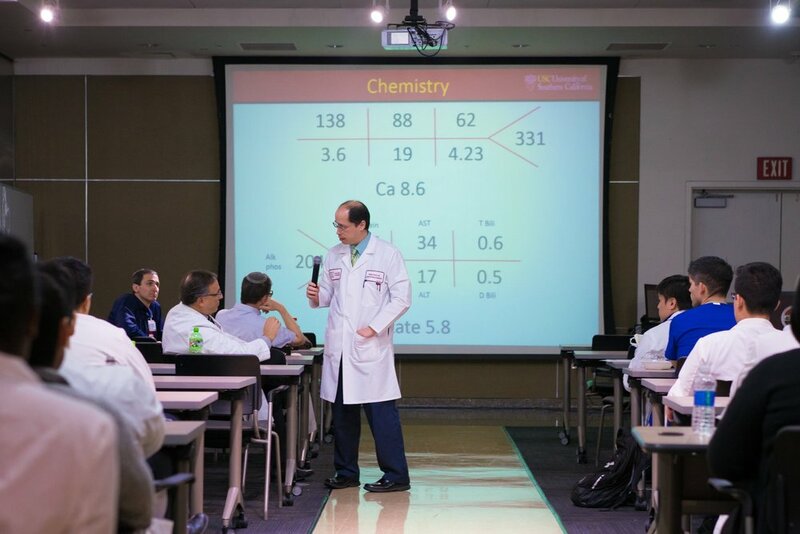 The curriculum includes bimonthly didactics from LAC+USC leadership, experts from the Schools of Medicine, Public Policy, Business and Engineering, and leaders from the Los Angeles community. Senior residents with an interest in global health and alternative healthcare systems can go on month-long elective rotations to a variety of USC-affiliated sites. Each site provides a unique experience to best explore the resident’s interests in healthcare delivery systems and clinical work.